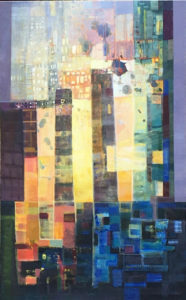 Linda Darby is an artist who has lived in Victoria BC for twenty years and is known for her acrylic abstract cityscapes. Her paintings are inspired by the city of Victoria, the ocean, and science fiction. She was born in Fernie B.C. and first went to school to be a primary school teacher. She always knew she wanted to be an artist, and eventually took time off to study art at the Emily Carr University of Art and Design. After taking an art teaching position in Kitimat BC, she met her husband and five years later they decided to sail the South Pacific Ocean together. While sailing Linda was able to teach art in different countries and kept journals and did a lot of water colours. The two eventually sailed to Victoria and have been here ever since. Linda has been very active in Victoria’s art community since settling here. She is involved in the Victoria Arts Council and has entered many shows across the city. She is now an established woman artist of Victoria and is an executive of the Victoria Chapter of the Federation of Canadian Artists, as well as the Fairfield Art Walk, and more. 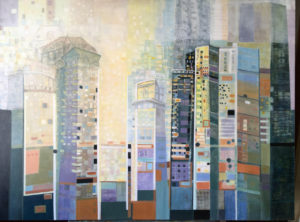 Linda is a community minded artist whose art shows the vibrancy and spatial density found in Victoria. In this interview Linda Darby and the interviewer discuss Linda’s educational background, her travels throughout the Pacific Ocean, Linda’s technical process in painting, her inspirations and intentions, and what being an artist in Victoria has been like for her since moving here twenty years ago (as of 2018). 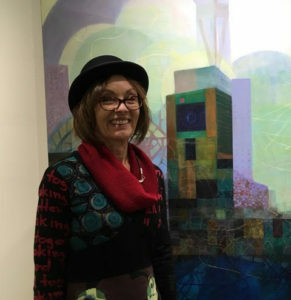 Linda Darby, artist, Victoria, woman, women, acrylic, painting, encaustics, Pacific, ocean, travel, teaching, education, technique, music, creativity, abstract, abstraction, cityscape, science fiction, process painting, and feminism. MG: All right. So, it is October 17th, 2018. My name is Melissa Granley, and I’m here with artist Linda Darby from Victoria. So, I’d like to start off with who are you, and what do you do? 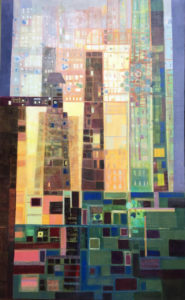 LD: I do cityscapes, large acrylic canvases that are reminiscent of some of my travels, and also the development that is occurring here in Victoria, the higher density that we are all experiencing. MG: Are you from Victoria, or did you come here? LD: I’m originally from a small town in British Columbia, called Fernie, BC, and I traveled a lot and taught school in many different countries, but settled here in Victoria about 19 years ago, when we bought this home. MG: Were you practicing art before you came to Victoria? LD: I was educated as a primary school teacher, and then I took some time off teaching to study art. I’ve always wanted to be an artist, but my family advised me to get me some kind of profession, so that’s why I took up teaching. And then I went to Emily Carr, and an art teaching position opened up in Kitimat. So, I took that art teaching position and met my husband Graham and we sailed away from Kitimat about five years later, and went to the South Pacific, and then we sailed to Victoria. So, I’ve been here ever since in Victoria. MG: That’s quite an adventure. LD: Yes, it was quite an adventure. But I taught art in different countries from the sailboat, like American Samoa. That was quite an experience. So that was wonderful to do that, and my teaching did come in handy throughout my life. MG: Did you start withdrawing or was it always painting? LD: When I went to Emily Carr, painting was dead. This was in the 80s. I studied animation and took all the courses that were already available like life drawing and other courses. But mainly we did performance art, too, where painting was used in some of our performances. And videotaping was very popular then, as it continues to be. MG: When did you mainly start focusing on your painting? LD: When I moved to Victoria and moving off of the sailboat where I mostly did watercolours and kept a visual journal, I got involved with the Community Art Council. I started painting with two other women. We entered the Look Show every year. And then we got more committed to our paintings and had three different shows at the Martin Batchelor Show Gallery, which has just closed this year. And so, for 17 years, I went every year into the Look Show and got my work into other galleries in town here, including the Art Gallery of Victoria, with the rentals program. And then three years ago, I joined a co-op, called the Gage Gallery, where I was an active member for three years. And also got involved in other community art programs, because I live in Fairfield, I was very active with the Fairfield Artists Association, and they have an annual studio tour. And so, I’ve been quite community-minded and participate in all of these available opportunities, like the Sidney Fine Art Show, or the Sooke Fine Art Show, too. MG: I feel like we’re covering a bunch of my questions, which is good. Let’s see … as an artist residing in Victoria, how does the Pacific Northwest, that is the city and the land, inspire your painting? LD: A lot of my paintings have water in them. Blue is one of the colours that I use very often, and so my experience as a sailor, and my continued experience, we still have a sailboat. Of course, as I mentioned earlier, the increase in density and just cityscapes themselves fascinate me. And Victoria is now more or less a city, so my interest in cityscapes with the ocean and front or some kind of blue in the painting is definitely influenced from living here on this beautiful coast. MG: Sometimes when I look at your paintings, I feel like I’m drawn into a futuristic scape. LD: Yes. I love science fiction, and I think that of course comes through in my paintings. MG: Yes. How did you come across the Victoria Arts Council? LD: I think they’re instrumental in becoming a painter, because as I mentioned, the Look Show, which is not an adjudicated show. I think it was a wonderful experience when I first came here just to be able see my work and meet other artists and see it displayed. I think this is very encouraging, and it moves you away from feeling like you have to compete. So now the Arts Council has adjudicated shows as well, and I’ve been in some of them. So, I think, you know, it’s a really good thing that we have here. I know it’s most other communities, too, but Victoria Arts Council is very active. MG: What would you say about the Victoria art community? Are you connected to other artists regularly? Is it easy to know who’s who? LD: Yes, it really is. I’m often asked by different art groups to do demonstration. So, in the last three years, I’ve given demonstrations to the Oak Bay art community, the Oak Bay Sketch Club, the Windsor Park Club, and I have been very active in the Federation of Canadian Artists, the Victoria Chapter. We have two shows a year. I’m part of the executive. I’m part of the Fairfield art walk and have been on the executive there for many years. And the Community Art Council, I’ve also accessed their galleries and they offer outreach programs that I’ve been active in. And I’ve also displayed with them at the airport and other … pretty well … this town is 800 artists, I think, we’re listed as. MG: That’s a lot of artists! MG: It’s interesting, because you think Victoria is a small city or like it’s not as big as Vancouver, but it does have a very thriving artistic community. MG: There’s so many galleries downtown and it’s fantastic. LD: Yes. Yes, it really is. And you know, places like Opus not only have places where you can go and learn more, we have the two art schools that I’ve studied at both. And continue to take workshops. I continue to keep myself involved and keep experimenting. I like the idea that I’m not looking at one style, but like Picasso, continually changing that. I’m an explorer. So that’s what I like about art here, too. MG: Although the style is very different, your palette, your color palette is very similar. MG: You seem to gravitate towards pastels and greens and blues. Is that inspiration from the water? LD: Yes, yes. I think it really is. It’s part of just living in this beautiful setting that we have. Anytime I leave Victoria, I’m always happy to get back. MG: That’s good. You’ve found a base here. MG: Is acrylic paint your preferred medium at this point? LD: Yes. Although I have been very successful in using encaustics. And along with encaustics, two or three different encaustic methods. And you’ve seen a collage. So essentially mixed media. But these last three years, and this next show that I’m getting ready for that’s going to be at the Fortune Gallery on Fisgard Avenue. It’s basically acrylic with different kinds of acrylic mediums that allow you to build up textures. And there are so many different kinds of acrylic mediums that you can use under acrylic paint or mixing with the paint, that I really enjoy that. And they keep coming up with something new. So, I’ve used, with the encaustic, I’ve even included eggshells and things like that to add texture. Well, now oil is improving. When I was at art school, at Emily Carr, I developed an allergy to oil. But now there’s a lot more water-based oil, so I’m looking at buying some oil sticks, too. I think oils offer you a better way to blend the colours. But at this point, too, I like acrylic because I like part edge painting. I use masking tape and my cityscapes acrylics really lends itself to that. MG: You were showing me earlier the beginnings of a painting and you were using sponges and masking tape. Could you explain your process when you start a painting and what that felt like when you stared at the blank canvas? LD: So generally, I put on, like Cy Twombley did, put on a ground. Often, I would use spackle, which is like a drywall. If it’s a large canvas, I’ll use acrylic mediums, like pumice or different ground sets. And there are some pouring mediums, that’s another one I really like. The acrylic pouring medium gives it a much smoother finish. And so I’ll build my canvas, from the start, with the ground. And then I paint a warm colour over the entire canvas, and then once I’ve established my composition, I’ll often look at ways of making sure the darks and lights are balanced to get successful composition where your eyes will arrive at a main focal point, even though I’m generally doing some kind of abstraction. MG: In terms of beginning a painting and being inspired, how do you know you want to begin a painting? Is it when you see a certain landscape or cityscape, or is it just in the moment and you imagine something? LD: I find there’s always in my paintings a role of memory. Even if … I’m always keeping active notebooks, and I draw and record images regularly from the outside world. The role of memory has been a very definite place, and so my paintings are a process. I do process paintings. I may have a definite composition in mind, but as I build the textures and add the colours, and like we mentioned, I don’t necessarily use brushes. I look for all different ways to apply the paint, from the sponges to forks, knives, palette knives, anything to get the actual feel of the paint. I like the materiality of the paint to come through, so that it has some spontaneity. I’ll often use pouring or splash or different kinds of ways of getting the paint to have some kind of spontaneity. So even though I do cityscapes with hard edge, there’s still an element of spontaneity. MG: Being in your studio was very interesting, because you were talking about how you don’t necessarily always paint on an easel. Sometimes you paint flat, and sometimes you move around. Do you think that allows you to be more flexible in your painting? LD: Yes. And I think that’s part of process painting. Because I’m not having to paint with a brush and sketch ahead of time. I’m not following a realistic object, so the painting is very much process painting and that I’ll arrive, and so of course I never know when it ends. In fact, I’ll often turn a canvas around if it’s been in one show and it hasn’t sold, I’ll often turn it upside down and use the old paint as underground and rework the canvas. I like to revisit canvas. It’s like a dialogue with an earlier self. MG: That’s very interesting. How do you know when a painting is complete? LD: Usually, it’s a deadline for a show. Otherwise, I think I’ll keep working it. Just like that joke about what happened to the artist? And they said he had too many strokes. MG: -Laughs- That’s very interesting, because it seems like you’re not a very static painter. Like you always have new things you want to convey. LD: Right. And also, I’ve learned from my paintings. I’ll have to show you some what I mean when I say I turn it upside down. MG: That’d be really interesting. I’m also wondering, do you ever have any difficulty articulating what you’re inspired by or do you ever have any artistic blocks? LD: Well, I’m very social. That’s why I’m very active in the art community. Also, I’m always volunteering on the board of all these different groups, from the Federation Committee of Artists Fairfield art walk to the Gage Gallery, I’m always very busy. So, the main problem is structuring my time and dedicating to producing canvases. So that’s why I like deadlines. I think I don’t have necessarily an artist’s block because I also study music, so I think if I’m not feeling in the mood to paint, I’ll play my guitar or banjo, and that will make me feel like doing something else. I think, I mean, I’m not a professional musician in any stretch, it’s just for fun. MG: That seems very in line with being an artist. LD: Yeah, exactly, exactly. And I paint on clothes. And I like to recycle clothes, like cut them up and make them again. So, I think that’s part of keeping my creativity flowing. So, it’s not always just painting, but I think painting becomes more of a product, because of entering a show. MG: Painting is a means of entering the public art sphere, but you can also learn how to live artistically in your everyday life. And bring your art into everything you do. LD: Yep. So, I think the most important thing I do is keep my journals. Just do what I call automatic drawing. And I learn a lot about my world and myself through my drawings. And I think my drawings are much freer than my paintings. I may overwork them because once again, if you’re putting it in a show, you feel responsible to make them “look good”, but it doesn’t necessarily work. Whereas a drawing, just spontaneously creating can be a lot more liberating and freer and more enjoyable, I think, to look at. MG: I keep journals myself, where I draw in them, and I find that if I know I’m not going to be necessarily showing it to people, or it’s going to be viewed by lots of people, I can just draw whatever I want. LD: Exactly. That’s what I’m talking about. And so, I think, that would be my goal as an artist. Just to let go, be a little bit less controlled. Because I think that’s why doing the other things, like whatever, using my creativity for cooking or making clothes or something, is freeing. I have to do them all to be successful, I think. MG: I guess this is in the same vein. Being an artist in the public eye, and people know your name, and people know who you are, is that difficult sometimes? Or do you enjoy that? LD: I think, I’ve been doing that for 20 years now in Victoria. So, I have gotten my name out there. And every year I get a little bit more active on social media. But ultimately, I think, the whole idea of painting is a very private thing. So maybe that’s why I’m playing music and that to be more with people. And so, in some ways, I think maybe the world has enough paintings. We should maybe be dancing and singing more. MG: Do you ever play music for people? LD: Just in the band that I play with. We’re very amateurish, but we do play for seniors on occasion and go to seniors’ homes and just to have them sing along with us. MG: That must be fun. MG: Yeah. Okay, I have some more questions … I did want to talk in the interview about your painting Blue Emperor and Phoenician. They’re on your website, and I was intrigued by them because they seemed so different from the other paintings that I’ve seen by you. LD: So those two painting were more the style that I was doing actually before I went and studied at the Vancouver Island School of Art. One of my favourite profs there was John Luna, and he said to me, because I was doing this magic realism, he suggested that realism is a hundred-year-old process of painting. And he used the metaphor that has stuck in my mind. He asked the question, why are you putting new wine, meaning my creativity, new creativity, into old bottles? But I revisited this way of painting, and in those two paintings, there is the realistic scorpion and a realistic Phoenician boat. Because I was exhibiting with two other women that I have been exhibiting the past 15 years but hadn’t exhibited with them. So, I did these two paintings for the Martin Batchelor Gallery in June 2018, when we had the last show there. And I think it helped fit in with their realistic approach. And I enjoyed doing it. It’s always … I think it’s good to explore and challenge myself with other ways. And of course, I think that one of the hardest things, living in Victoria, is the predominantly popular realist art is what sells. And I think it’s kind of easy when you do realistic painting, people will say, “oh, look at that. That really looks like a scorpion.” Whereas if you have an abstract painting, they’ll kind of maybe grimace a little because they’ll feel they don’t understand it, even though abstraction is well over 150 years now. It’s still not as familiar to people as a photograph or a table that’s a still life, where they can identify that pear and think it’s wonderful that you could represent it like a pear. MG: As an art history student, I enjoy abstraction and I find it very valuable. Because I find that, especially your paintings evoke a sense of emotion and like a freshness of curiosity. They’re very bright and vibrant. So, it’s interesting when people don’t necessarily have the same background in art as artists and art historians. LD: Exactly. That’s right, that’s right. My interest in science fiction and establishing a different perspective. So often in my cityscapes, there’s… I’ll just look at this green space behind you. There’s the front part, is like when I was traveling, I was reading a map. So, there’s a different spatial relationship than with a projected sense of depth. Because of the colouring, I’ve got a sense of depth and in this case, you move between the two. And my goal is to establish an intimate connection for the viewer, because some of my paintings, you don’t know if you’re moving into them or moving away from them. And that’s what I’m interested in, how our perception of space and how we view things. And throughout art history, this has always been from the Cubist who showed us how cylinders got flat rectangular shape in it and two circles. It doesn’t have to have that shading to give it the depth. It can be portrayed on a flat surface. I think we have a lot to learn psychologically about how we perceive things. And in my painting, I’m always moving in that direction, because that’s my main interest. MG: It is interesting, because you can see where the foreground is and where the background is based on how intense the colours are and whether they’re really stark lines or they get a little blurrier towards the background. LD: Exactly, exactly. So, I’m using some of the classical techniques of how to create depth in a painting, and I’m combining what many artists are doing today painting, combining the old and new techniques. MG: Do you have any artists that you’ve been inspired by from the past or now? LD: Oh, some of my travel, and especially going to London and looking at the Russian Constructivism and that’s where I do continue to use straight edges and squares and rectangles. And I like to use geometric abstraction to kind of build a sense of place. And so, I think that’s my main influence. Of course, Kandinsky, I always loved those colours that he uses. So, I think he is probably … I have seen some originals and I’m always thrilled to do that. And Mondrian. Even the impressionists, who I like, because their use of colours. So, yes, I think I continue to study art history and I think it plays a significant role in my art. MG: Kind of circling back to the conversation we were having earlier, you were talking about doing shows with other people. I have friends who are in fine arts, and they have to do shows with other people sometimes, and they’ll try to make their art complementary. MG: Do you find that challenging or is that beneficial? Do you think that makes you learn more? LD: Yeah, it is. These are the challenges. Just realizing that, like in this upcoming show in April, I have with the four other women artists. We’ve limited our palette and also, we’ve agreed on having the same size canvas in our attempt to make a more cohesive show. I think group shows are wonderful because they attract more audience. Everyone brings their share of friends and family, but at the same time, they offer the viewers a variety. But keeping a cohesive show together is always a challenge. And so that’s what we’ve done in this case, limiting the palette. And it’s a challenge. And I think we do, we just influence each other. I think the idea of competition is an illusion, because you really are painting on your own. But at the same time, we are living in 2018, and if we’re going to be a contemporary painter, we have to allow our own thoughts. We have to move away from imitating realism that’s part of the 18th century. But there’s so much pressure to produce … that’s what I’m saying, that sometimes I fall right into doing realism without questioning it. It just kind of happens. Because I think having self-doubts is very common. It’s very natural. And I think part of me would like to do the familiar and have someone say, “Oh, that’s a bluebird. Isn’t that beautiful?” Or “That’s a blue scorpion.” And so, I think sometimes I fall into that until I remind myself and start another painting. MG: With your abstract paintings, when you’re basing them off of Victoria, do you think people can gauge that they are Victoria? I feel like I can. I feel it, where you’re coming from. LD: Yes. Like, this one over here. There was the blue bridge at that time. LD: And I’ll show you this other painting that I’m turning upside down. LD: Okay. I’m just going … I have it in here. This is an example of what, to me, definitely … in fact, I called it “A Port City.” To me it’s about Victoria. Where we’re getting more buildings, and there’s the water. But now when I look at it, I wasn’t happy with it. So, I turned it upside down, and I see the part that I’m happy with is this part. MG: Is that the intended reflection? LD: Yes, yes. That’s the reflection. So now the reflection is softer, more pastel. I’m going to free myself from this part here, and really work this part, right? So that this part will become a lot more blurred. And so that’s how I’m inspired now, by this part, which is the only part I like. So, this is what I mean that it’s really a process, how I’m painting. Because I can see that maybe, even if I was in a different psychological state, maybe I have softened up in my world view or something. Then I was looking here, because this is so much more controlled. So now, through a series of washes, and breaking down some of the hard edges, I think I’m going to arrive at a more cohesive painting. And also, I wanna keep this movement going through here. So maybe I’ll do some pour painting or something over the top of it. MG: I definitely see the Victoria inspiration though, it does look like in summer when I would go downtown. LD: And I like how this almost has the pastel top look to it. Because the underground is coming through. So, I think that’s who we are, too, as contemporary people. We have all this history behind us of how our ancestors were and enjoyed life. We don’t really have that opportunity. I think our world is so fast-paced, that we don’t have a way of just having more of a flow like it was in the 1800s. So that’s where I think I might be arriving there, in this part. MG: I think there’s the juxtaposition it being hard on the bottom, where you are really liking it. And then I think the top goes along with what you just said. LD: But the thing that happens to me, is that… well, I like painting large. This is, I think this is 36 by 48. And most of the shows are restricted in their size. Like the Federation, because the number of artists in town, they are restricting to 24 by 36. So, I’m going to rework this painting, but I may never get to show it! Unless it’s in my house. But that’s all right. That’s why I have had, in the past, I’ve had many solo shows, because then you can have whatever size canvas you want. But it is a daunting commitment, you’ve got to have at least 15 new paintings. MG: And paintings take a long time. They’re not just like, oh, done in a week. LD: That’s right, that’s right. Now some of my smaller paintings, I’ll show you the two I just got into the next show I’m in, the art rentals, where it’s a small work. I just learned that they got in. I call this one “Villa de Nuit”, at night. And this one is the “Villa du Matin”, the afternoon. They wanted examples of my larger work, cityscapes. So, it’s the same process of having a very strong ground. And it was here I integrate the ground with the cityscape. So, they have to me kind of a haunting feeling. Like you think there’s going to be a ghost coming out. MG: They are very different from your other works, just the colours and the size, of course, and the composition as well. But they’re very spooky, I guess. LD: Yeah, spooky. I think that’s kind of … I don’t know if anyone would want to live with them, but it’s kind of interesting. That’s what the paint … because I did a lot of layers, and you see, if you look there, there isn’t one colour. I showed you that process of just keep building the colours, so the colours come through. I like that. And then I used some charcoal over top to get the idea of a building structure. MG: They are very textured. LD: Yeah, very textured. But I think they’re also reminiscent of European streets. MG: That’s what I was thinking. It looks like a street maybe in Venice, where there’s not much room to go through them and the buildings are up high because they ran out of room. LD: Exactly. Yeah. And that’s what I mean by the role of memory. Like I didn’t paint this from a card, or a picture, but from a memory of being there. MG: That’s interesting. Because some artists, they need a picture, a reference, but other artists, they just paint from their head and what they’ve seen and then they try to replicate that. LD: Yeah, and that’s where I think, like you’re doing, just drawing in books, in your notebook. It just comes through. LD: Yeah. Like if I got some paper and pastels right now, we would just … it would come out what you’re thinking. You know? MG: Wow. Well, I guess I still have a few more questions. Do you have an artistic goal? So to say? LD: I think my goal, of course, is not necessarily just art goal, but my art is helping me towards that, I think the word is individuation, to become an authentic person. And there is so much pressure to produce a product in painting that it isn’t as easy to do original work, to do your own original composition and be authentic. And so that’s my goal. I think that’s what’s so interesting about our creativity. I like to believe we’re all creative, and we make our own opportunities to be creative. And it doesn’t necessarily have to be with paint. But that whole process is vital to our growth as individuals and our whole culture and community and our nation. We need to loosen up, be more aware of the background of who we are fitting in with our world and be a little more at peace. MG: I love that. I think that’s an important thing that a lot of people need to figure out and pursue. MG: Is there any advice that you would give to emerging women artists in Victoria? LD: I think, personally, join the Community Art Council, because they have opportunities. As I mentioned earlier, you can go to the Look Show. Whoever enters, gets hung. And so, I think that commitment of being part of a show and you don’t necessarily have to frame your work or anything. You just have to get it down there in time, and there’s a hanging fee, but it’s very low. I think it’s only ten dollars. And a lot of women, especially women, they don’t have the confidence to do that. And I say, just do it. MG: That’s good. We were talking in class today about how in Canada, only like 15% of shows are women. So that’s why we wanted to focus on women artists of Victoria, because it’s important that women are getting themselves out there. You were talking earlier about how it’s not necessarily about competition and I think that’s a very important thing. MG: Interesting. I feel like I would enjoy this. LD: Yes. Oh, I think you really would. MG: I took out a book. We had to make up a bibliography of resources for our interviews. I took a book, it was about postmodern feminist art, which was interesting. Because it did talk about Renaissance art from a feminist perspective. And the feminism didn’t necessarily exist back then. The female gaze has always existed of women being in art and interacting with art has always been around. LD: Right, right. I think my art, because it’s got this geometric abstraction as predominantly, as I said, from the Russian Constructivism to the Cubists, it has been a male view. But I think, in my attempt to show more than one perspective in my paintings, that it is more of a female view, and that is continually looking for ways to be a woman in this society, to have a voice without necessarily competing with men. And that’s what it’s all about this, this idea that we are, even in the world of commerce, when we go out into the world, we have to speak like a man and compete like a man to make any money. And I think we have to move away from that in our art. And I think that’s just the point that she makes very clearly. And she gives the whole development of when women first were allowed to even show in a show. And you know, it wasn’t that long ago. It was in the 40s and 50s. And they had to have their own art museum in America. They didn’t have any women in the other museums. But now since we’ve moved away from that, but at the same time, each of us need to find our own voice and do that by honouring our feminine. MG: That is interesting, because I guess women being in the arts is so relatively new, and for a person like me, I’m only 23 years old, I think that women have always been in the arts, so they should get more attention. But when you put it like that, it makes sense that there’s still a lot of work that needs to be done, and I think like younger women artists have to look to older female artists who’ve been around for longer and have witnessed all of that. Do you feel as though your experiences in the art world have been very gendered? Or have you had any experience where you felt like well, I’m a woman, and it’s like this because I’m a woman? LD: At Emily Carr, there were no female instructors, when I went in the 80s. And prior to that, I went to Kootenay School of Fine Arts, in Nelson, BC, where I took some of my teacher’s training, and was affiliated with the Notre Dame College, University then. And there were no women instructors. Only when I arrived in Victoria, here, at Victoria College of Art, where Wendy, the principal, is a woman. So, I think we have, here in Victoria, quite a few examples and a lot more women instructors in art. And I think that’s really wonderful. There’s a lot of successful women artists in town, making a living from art. And they’re not just in the quote “women’s”, like fabric art. They’re in all the genres. And now we have women poets who have been part of our community, as resident poets. I think we’re fortunate, and that we need to celebrate ourselves as women, and move away from the competitive idea. MG: I like that. That’s a good sentiment. LD: And celebrate that we have a better, a deeper, a bigger, a broader view. Because we have two breasts and two eyes. MG: Better than one eye. I have one more question, and it’s not much of a question, because you’ve brought it up before, but a good thing to end on, I think, is what can we look forward to in terms of new series, and do you have any shows coming up? LD: Yeah. At the Fortune Gallery, it’s on Fisgard. It’s owned and managed by a woman. And it hasn’t been there that long. It’s changed hands a couple of times, and yeah, it’s always good. It’s a group show, but I think it’s really an opportunity, just like the other opportunities here with the Federation of Canadian Artists. There’re both men and women in that group, and it’s a national organization. Once you join the Federation of Canadian Artists, the Victoria Chapter, you can compete, and you can enter other shows in Vancouver and across the country. MG: All right. Thank you very much for letting me interview today. I think we’ve had a great conversation. I had a lot of fun. LD: Yeah. And good luck to you, too. Broude, Norma, and Mary D. Garrard. Reclaiming Female Agency: Feminist Art History After Postmodernism. University of California Press, 2005. Madden, Aaren. “Avenues of Communication.” Focus Magazine, May 2014, pp. 32-35. Mohrsen, Diana. “Colourful Acrylic Cityscapes.” LIFE AS A HUMAN, 8 Sept. 2014, lifeasahuman.com/2014/virtual-art-gallery/colourful-acrylic-cityscapes/. Schor, Mira. Wet On Painting, Feminism, and Art Culture. Duke University Press, 2012.